The Secure Store Service in SharePoint 2010 replaces the Single Sign-on Shared Service of MOSS 2007 and provides an easy way to map user credentials of external resources like SAP systems to Windows users. During the process of developing SAP interfaces using the very handy ERPConnect library from Theobald Software you have to open a R3 connection with the SAP system using SAP account credentials (username and password). In most cases you will use a so called technical user with limited access rights to execute or query objects in SAP, but a SAP system saves a lot of sensitive data which cannot all be shown to all users. So, creating a new secure store in SharePoint 2010 to save the SAP user credentials will be the solution. Accessing the secure store from program code is quite simple. A trail version of the ERPConnect library can be downloaded at www.theobald-software.com. 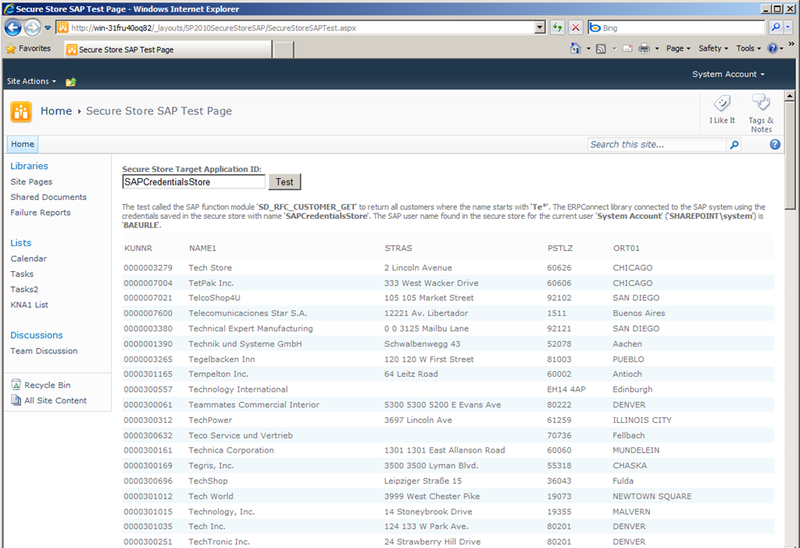 As the screenshot above shows is it possible to create multiple target applications within one Secure Store Service. 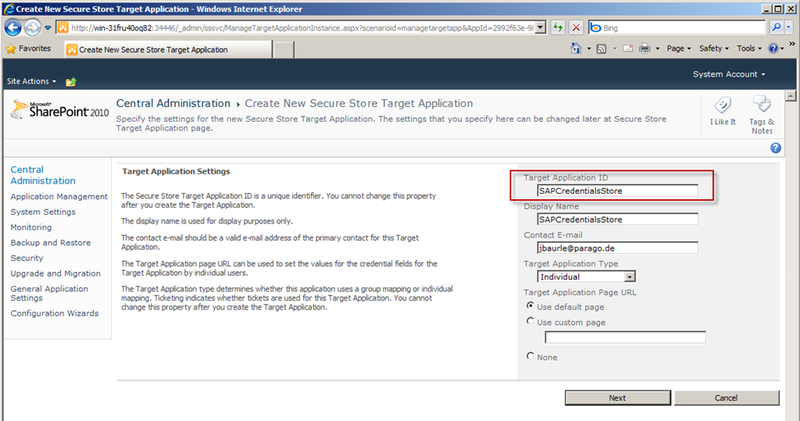 Clicking the New button will open the Create New Secure Store Target Application page. In this dialog you have to enter the new Target Application ID, a display name, a contact email address and other application related details (see screenshot below). It’s important to select the field type User Name and Password, because our implementation later on will check the target application for those two field types. 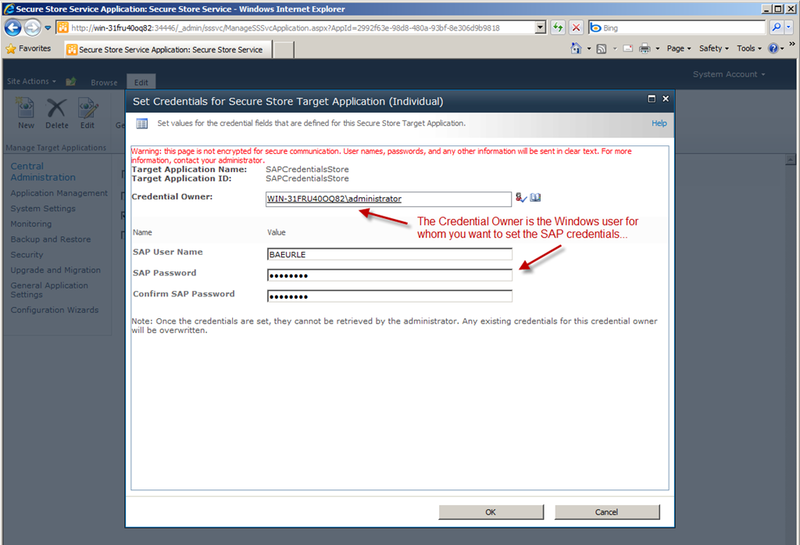 The Credential Owner is the Windows user for whom the SAP user credentials will be set. Enter the SAP username and password and click the Ok button to save them. Accessing the secure store by code is simple. We implement a SecureStore class which will encapsulate all the access logic. A second class called SecureStoreCredentials contains the retrieved user credentials returned by the method GetCurrentCredentials of the SecureStore class. The constructor checks if an application ID is passed and if it’s valid by calling the static method IsApplicationValid. In first place, the IsApplicationValid method is creating an instance of the SecureStoreProvider class to get access to Secure Store Service. The SecureStoreProvider class provides all methods to talk to the SharePoint service. Then, the method queries for all target applications and checks for the given application. If the application has been created and can be found, the method will analyse the application field definitions. The IsApplicationValid method then looks for two fields of type User Name and Password (see above). The GetCurrentCredentials method is actually trying to get the SAP user credentials from the store. The method is creating an instance of the SecureStoreProvider class to get access to service and then calls the GetCredentials method of the provider class. If credentials are available the method decrypt the username and password from type SecureString using the internal method GetDecryptedCredentialString. It then will wrap and return the data into an instance of the SecureStoreCredentails class. For more details of the implementation see the source code. The interesting part is the retrieval of the SAP user credentials from the secure store defined in the text box named ApplicationID. The application ID will be passed as parameter to the constructor of the SecureStore class. After creating the instance the method GetCurrentCredentials will be called to ask the store for the credentials of the current Windows user. After the user credential query has been successfully executed the SAP connection string will be constructed. Then the connection string will then be used to create an instance of the R3Connection class to connect with the SAP system. The remaining code is just calling the function module SD_RFC_CUSTOMER_GET and binding the result to the SPGridView. Very handy, i’ve been troubled by this at the moment at work but this has come in handy.